This feminine top by Linda Skuja is created with a simple stitch pattern for the body and a delicate layer of ruffles at the top. 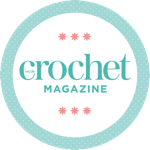 Get to work on this project with a copy of Inside Crochet issue 102. If you're not a subscriber, you can still pick yours up by ordering online, or by downloading an issue directly to your smart device. Linda Skuja is a crochet designer specialising in innovative techniques and fashion-forward designs. Look for her as ElevenHandmade on Ravelry and Instagram.